Recently, Anthony Pompliano (“Pomp”) interviewed Changpeng Zhao (“CZ”) in an Off the Chain podcast titled Binance and the Future of Global Crypto Regulation. There’s a great moment around minute 12–13 or so, with an extremely powerful insight into crypto law. It’s bracketed in a lot of other fascinating analysis, so you might miss it. Because it goes to the heart of the crypto law dilemma (how to build new legal forms using existing legal blocks), we thought a short excerpt would help highlight where we stand at the start of 2019. CZ: [Many] missed the international aspect of blockchain. Binance is one of the earliest companies that rolled out simultaneously in 180 countries. Most of the mentality before was: let me target and conquer the U.S. market first, then we’ll move to China, then we’ll move to India, then we’ll move to Europe. Now, there’s no borders. You can grow in many countries at once. In the early days, that was on the key factors that allowed us to grow quickly. Pomp: This idea that the blockchain permits a world without borders is fascinating to me. As you were building Binance, what would you say were the biggest challenges? Obviously there is the regulation challenge, but other than that, what else were those challenges in the early days that maybe people don’t know that you faced. CZ: So, the regulatory space is very challenging when you are growing in 180 countries because theoretically there are 180 slightly different variations of regulations going on. Also, in our industry, to be honest, the regulations are still unclear in most of those countries; probably in all of those countries to some extent. So that’s always challenging. You don’t want to step on someone’s toes; you don’t want to violate something. But the rules are not clear. What you can and cannot do is a little bit fuzzy. So you have to have a very strong moral compass. You have to have very strong ethical values. As the team gets bigger, we have to make sure the ethical values are inherent in every person. So we have to hire people very carefully to have that value. So that’s probably the biggest challenge we have — to get the team right. Once you have the team with those kind of values, things become a lot easier. 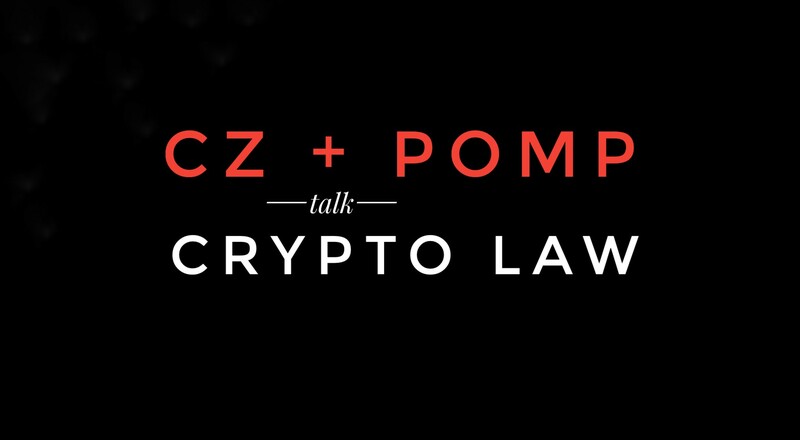 CZ’s insight affirms the heart of Crypto Law Review’s intervention in the space: the importance of getting to maybe with respect to crypto legal forms, processes, and institutions. This means realizing that the fuzzy gray area is not necessarily a “bad” thing; often, it is as clear as any regulatory scheme can get. Legal ambiguity is not a problem to be “solved;” in smart hands, it’s an opportunity to be seized. Pomp elicits many more great insights about how small teams of well-motivated people can redefine the world. For context, Binance is the world’s largest crypto exchange, yet the firm is run by just 400 people working across 40 global locations. What’s the secret to Binance’s success? It’s not just a platitude about a “firm-wide commitment to strong ethical values.” It’s not just because Binanciers have a massively transformative mission. Binance is a success because CZ realized that the key to unlocking value is to give everyone far more utility than they had under the previous set of ambiguous regimes. Binance’s core value proposition isn’t the elimination of regulatory uncertainty; it is the elimination of barriers to blockchain hyperutility. Kudos to CZ for a bold move forward; and kudos to Pomp for eliciting these refreshingly honest and powerful testaments and bits of analysis. Hearing a leading crypto developer “get to [crypto legal] maybe” in such an effortless and matter-of-fact way isn’t just validation for globally-minded crypto analysts— it’s inspiration.